Working with children is one of the most highly unpredictable things one can do. As the mature adult of course you try to maintain your composure, but there are times I laugh right along with them. I can’t help it: they make life joyful. I really have no clue how they come up with their ideas, but it’s brilliant to watch their creativity unfold. We were walking in the ravine a few weeks ago and two students discovered that the snow had formed into a semi-hard layer of ice on the surface. 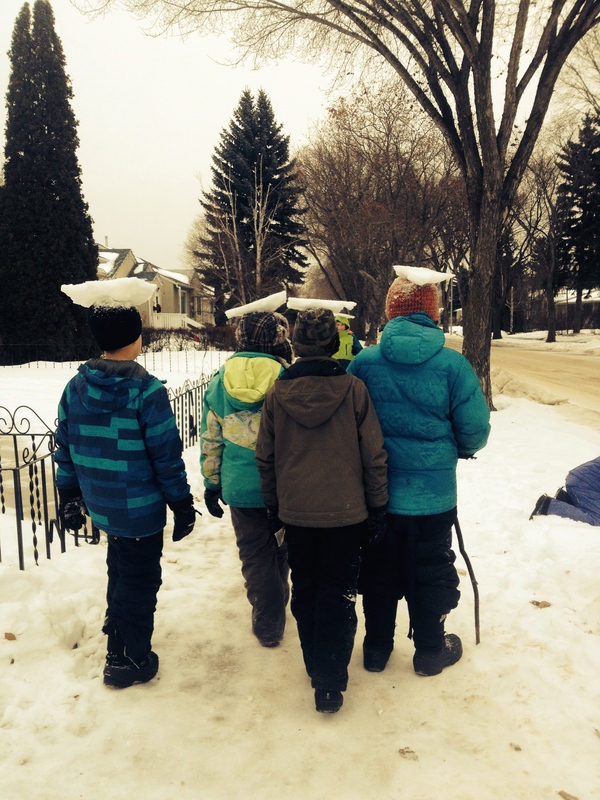 Using their mittens they carved out dinner plate sized blocks of ice and began balancing them on their heads. Once a few students had done this it caught on like wildfire. 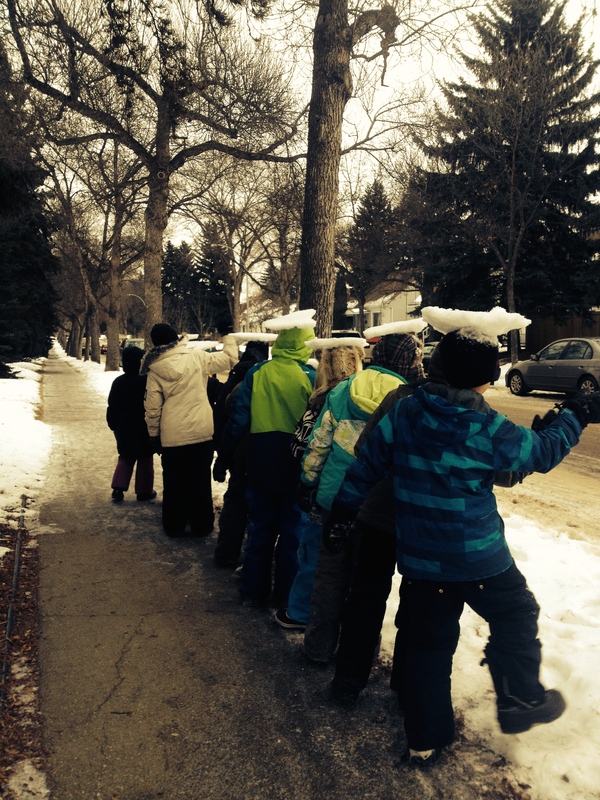 Before you knew it I had 19 ice-heads walking, teetering, balancing next to me. 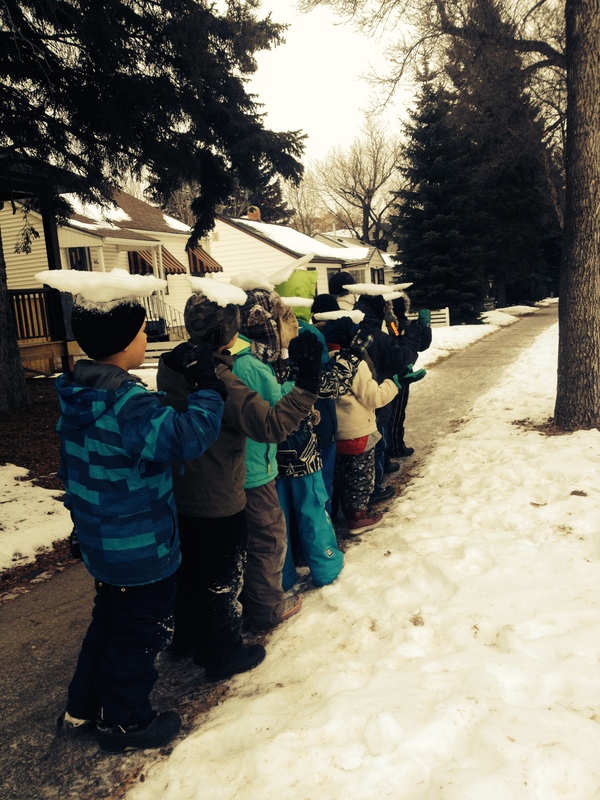 When it was time to go, they decided to see if they could keep the blocks balanced for the entire 1.1 km walk back to school. They came up with these rules: no picking it up if it drops, you’re allowed one free adjustment of your ice block, etc. Cars were passing us and slowing right down to see what on earth was happening. Others smiled as they passed, and waved, chuckling as they remembered the joy of childhood. The children derived great pleasure from attention they received from passersby, and I believe we spread a little warmth on that cold day. These are the moments I never want to forget.